Region: This fly is found as various species throughout North America. Life cycle: This insect produces several generations each year and in most species, hibernation is done in the pupal stage. Physical Description: These black flies are often brightly colored with yellow bands that resemble a bee. They hover over flowers, beating its wings so fast you can hardly see them and staying in one spot like a hummingbird. They are usually a little larger than a housefly, about 1/3 to 1/2 inch long. Its oval eggs are white and are laid singly or in groups on foliage. The green to gray or even brown larva are about 1/2 inch long. Feeding characteristics: This insect feeds on nectar and pollen as an adult fly, acting as a pollinator. The larva's diet consists of aphids, mealybugs, Leafhoppers, and scale. In fact, a single maggot has been clocked at eating one aphid each minute over a long period. They hold their prey up high while draining them. Controls: None required. This fly is beneficial to the gardener and farmer in both the larvae and fly stages. 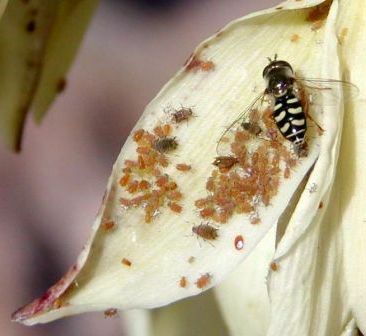 If you notice these maggots on your flowers, hold off with your sprays and dust. In fact, you can attract the adult flies by providing flowers that bloom throughout the growing season.